Please tell a friend about these free downloads so they can benefit from them too!! These downloads are available for earlier versions of MS Excel too. FYI: Here’s another free budget I thought I’d add to the list – The Super Starter Budget from Savvy Spreadsheets. It’s also a very simple budget, complete with easy to follow step by step instructions and everything – it almost doesn’t even look like a spreadsheet! This is a good option for those looking for something even more basic than the EOD Basic Budget, but it does require a newer version of Excel. 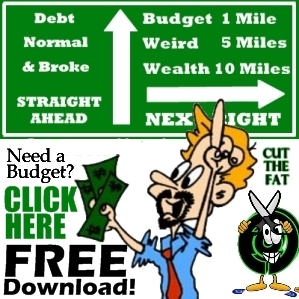 Please Enjoy and Happy Budgeting! Hi, I have a Mac, with excel but the page does not open. I click on the download, retreive it from my download folder, and then excel opens it but there is no page. Can you help me? Also, if you are monthly paid how do you convert the weekly columns to one? Finally in South Africa we use Rands, how do I convert from the $ sign to R? 1 is a Comprehensive Insurance inclusive of car(s) & household. Would you still slot it under the mortgage? 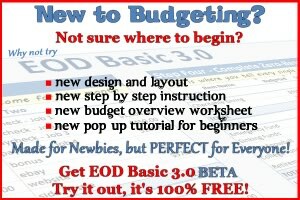 I was very impressed with your Delux Budget 2.0, so I downloaded the zip file for EOD Basic Budget 3.0. The zip file only contains html links and folders. How do I run it or what do I click on to run it? Sorry to hear about your trouble downloading 3.0. I have not been able to figure out why some people are having trouble downloading 3.0. It could be that I created it in Office 2007. I do not have trouble getting it to work properly so I’m not sure what to tell you. I wish I could help. Are you sure that the download box is using MS Office to download the file. Some people are telling me that it’s appearing as a zip file but I don’t know why. Hello what is the password to unprotect in on excel? I’m looking into this but I’m the one that created the spreadsheet and as far as I know there was never any password protection added. I’ll continue to try and figure this out though. I am trying to add a spreadsheet into the budget excel sheet. However because it is password protected I cannot. Have you found what the password is yet? I want to calculate all my credit card debt and add it into the spreadsheet. THANK YOU so much for the spreadsheet!!! Cherie, if you hit cancel, when it asks you for a password, it will still pull up. it did for me. How would you address the issue of budgeting when a monthly gross or net is not predictable. I have my on business and work as a consultant. My monthly income is NEVER the same. And in addition to that, I am never paid on any consecutive time frame. I would love to start budgeting, but it seems to overwhelm me. I need this practice badly. Not sure I know the answer for you unfortunately 🙁 We’ve never tried to open it in anything outside of Microsoft Excel. Maybe try Googling and see if you can find a similar (and cheaper) program? I’m sure there are some out there – just a matter of finding them 🙂 Good luck to you. Thank you! Your spreadsheet is awesome! !